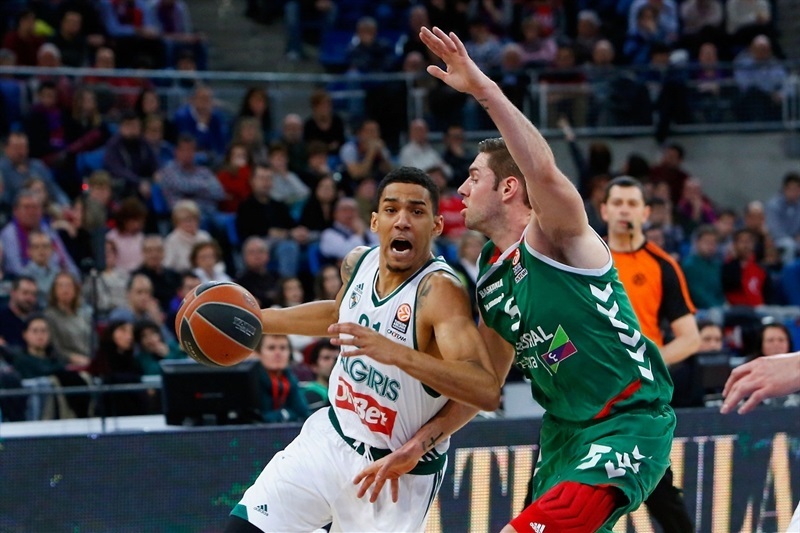 Laboral Kutxa Vitoria Gasteiz rallied from an eight-point deficit in the fourth quarter to down Zalgiris Kaunas 71-65 at home in front of over 10,000 fans at Fernando Buesa Arena in Group F on Thursday. 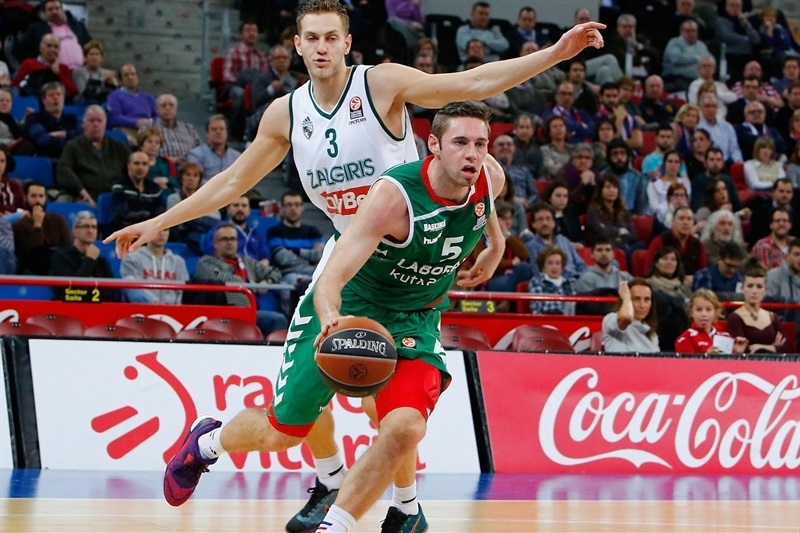 Laboral improved to 6-2 in Group F while Zalgiris dropped to 1-7. 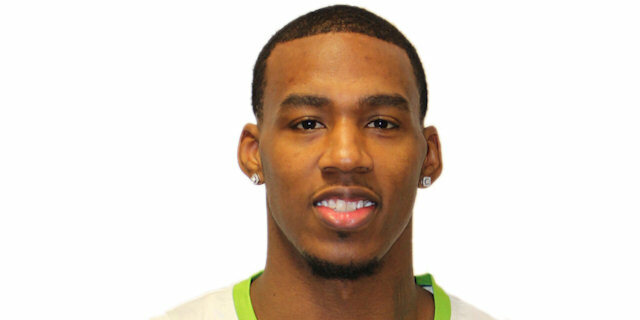 Darius Adams led the winners with 17 points. 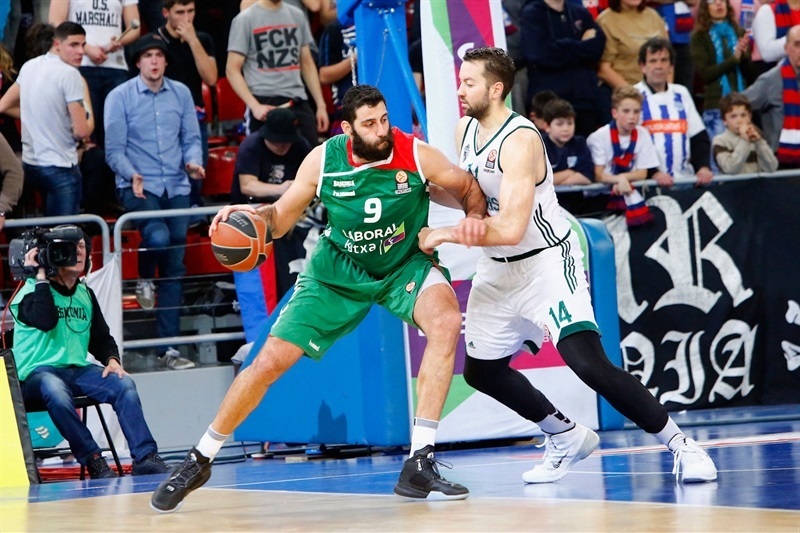 Ioannis Bourousis added 16 and 11 rebounds while Fabien Causeur had 14 points for Laboral. 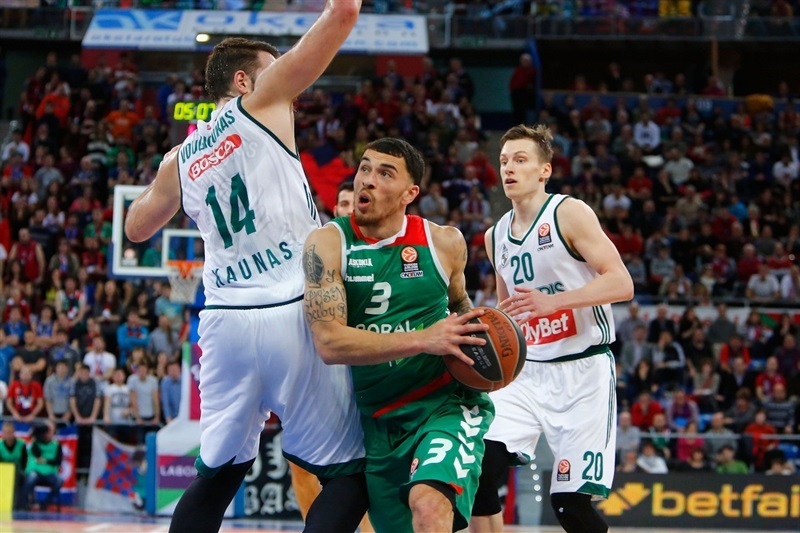 Ian Vougioukas and Paulius Jankunas each had 13 points for Zalgiris. 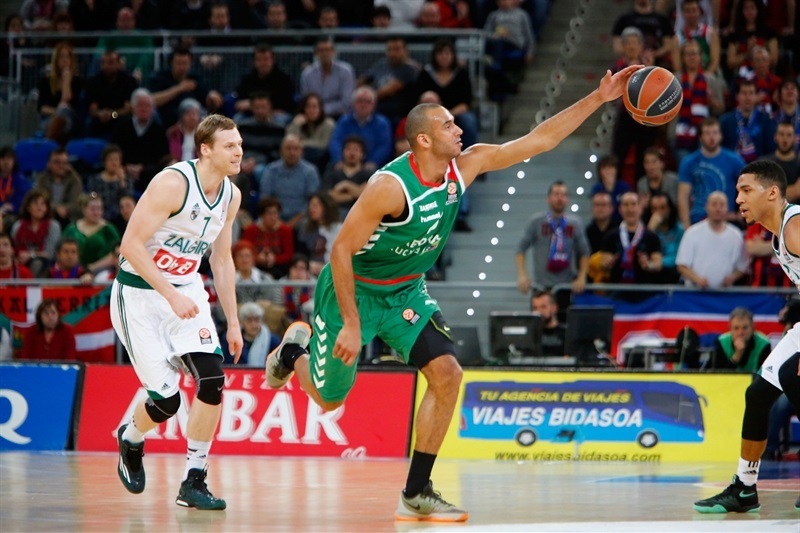 Vougioukas added 13 rebounds for his first double-double in 79 Euroleague career games. 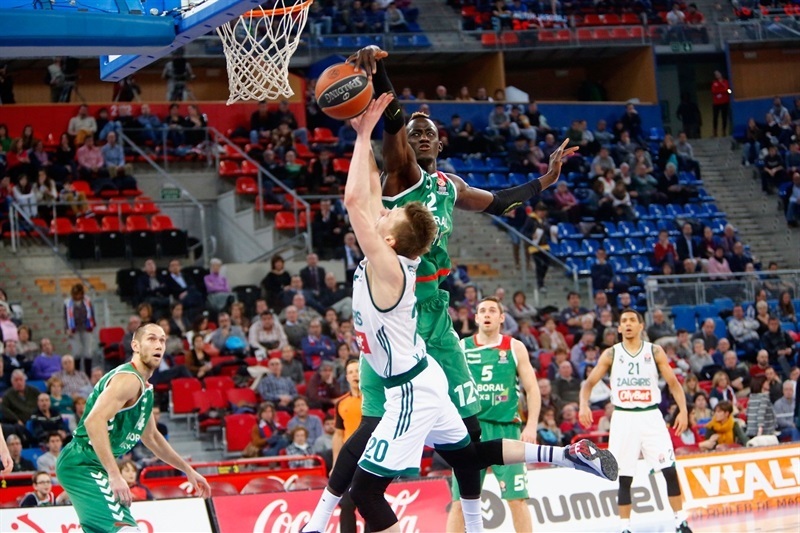 Zalgiris opened the game with a 0-7 run and still led 19-20 late in the first quarter but a three-pointer by Adams gave Laboral a 22-20 lead after 10 minutes. Adam Hanga dunked off a steal to boost the hosts' lead to 29-26 but Olivier Hanlan and Vougioukas helped Zalgiris tie the game, 32-32, at halftime. Causeur gave Laboral a 45-43 lead but Vougioukas led a 0-10 run that allowed Zalgiris to get a 45-53 margin after 30 minutes. Bourousis and Adams combined for 20 points in the fourth quarter. A three-pointer by Adams gave Laboral the lead for good, 65-63, and Bourousis hit 4 of 4 free throws to seal the outcome down the stretch. Edgaras Ulanovas got Zalgiris going with a layup, then a three-pointer by Kaspars Vecvagars gave the guests a 0-5 lead. Jankunas hit his trademark baseline jumper but Ilimane Diop split free throws and Causeur struck from downtown to keep Laboral within 4-7. Adams and Renaldas Seibutis traded layups and a free throw by Hanga brought the hosts as close as 7-9. Jankunas nailed another mid-range jumper which Diop erased with foul shots. Jankunas kept pacing Zalgiris with a fastbreak layup but Hanga made free throws and Causeur scored in transition to tie it at 13-13. Martynas Pocius shined with a driving layup and Lukas Lekavicius erased Causeur's foul shots with a one-handed jumper in the lane. Jaka Blazic took over with back-to-back layups to give Laboral its first lead, 17-19. Siim-Sander Vene hit a corner triple but Adams beat the buzzer with a bomb from downtown to restore a 22-20 Laboral lead after 10 minutes. 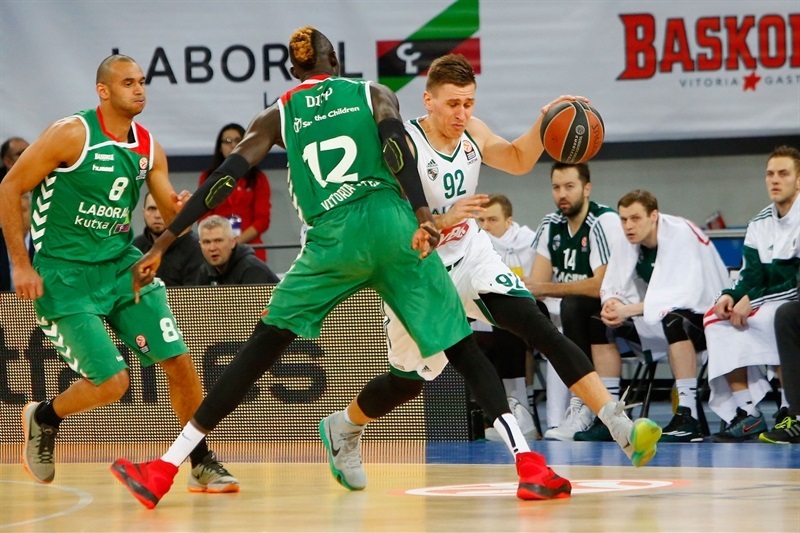 Davis Bertans split free throws early in the second quarter as Zalgiris went scoreless for more than 2 minutes. Bourousis banked in a turnaround jumper that Vougioukas bettered with a three-point play. A three-pointer by Brock Motum put Zalgiris back in charge, 25-26, making the hosts call timeout. 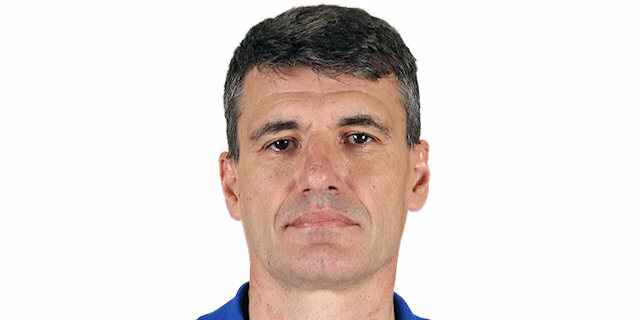 Laboral tried to improve its offense using a more athletic lineup, with Hanga, Blazic and Mike James together on court. James scored in penetration and Hanga dunked off a steal to force Zalgiris to stop the game at 29-26. Vougioukas split free throws and a driving layup by Hanlan tied it at 29-29. Bourousis stepped up with a tip-in, as the game turned into a physical battle. Adams split foul shots but Vougioukas singlehandedly tied the game, 32-32, at halftime. Ulanovas hit his trademark jump hook in the low post soon after the break and Hanlan struck from downtown to give Zalgiris a 32-37 margin. Kim Tillie buried a three-pointer from the right wing and Causeur copied him right after that to put Laboral back in charge, 38-37. Causeur made free throws to cap an 8-0 run before Seibutis beat the shot clock with a mid-range jumper. 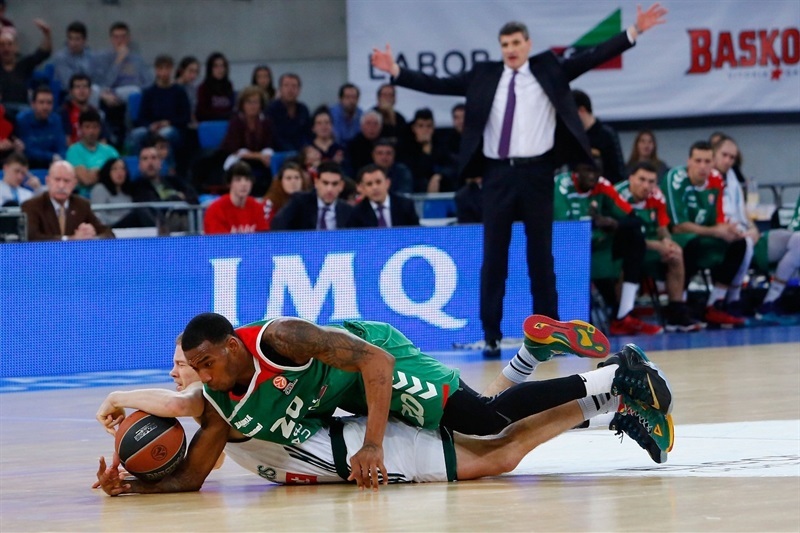 Jankunas nailed a turnaround jumper, as Zalgiris kept dominating the game rhythm with outstanding defense. Bourousis split free throws and soon added a layup for a 43-41 Laboral lead. Vougioukas shined with a put-back basket and erased Causeur's layup with a one-handed slam. Seibutis buried a wide open three-pointer which Ulanovas and Vecvagars followed with free throws to boost the guests' margin to 45-52. Motum split foul shots for an eight-point Zalgiris lead, 45-53, after 30 minutes. Fourth quarter: Down to the final minute! 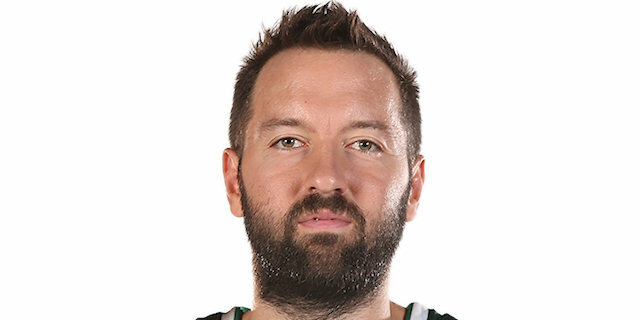 Bourousis made free throws early in the fourth quarter and soon added a catch-and-shoot triple to force Zalgiris to call timeout at 50-53. 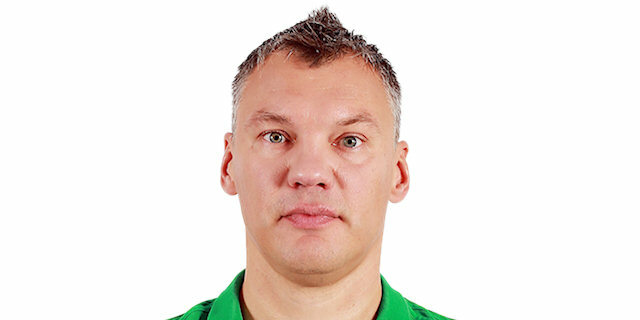 Zalgiris had started to miss open shots and also entered the penalty bonus with over 7 minutes left. 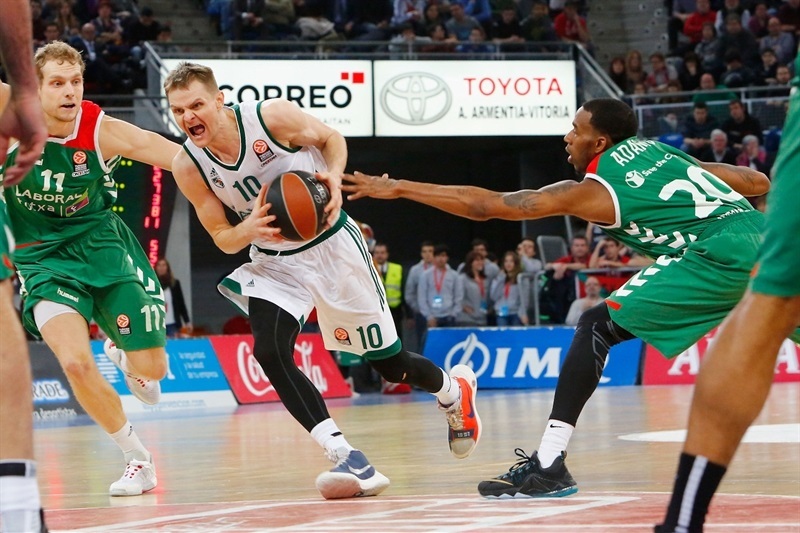 Lekavicius finished a four-chance Zalgiris offense with a three-pointer but a driving layup by Adams kept Laboral within 52-56. Bourousis found Adams for a backdoor layup which Jankunas matched with a close-in jumper. Adams kept leading Laboral with 1-of-2 free throws and an assist to Bertans for a corner triple that tied it at 58-58. Vougioukas hit an off-balance shot, Adams answered with a layup but Jankunas put Zalgiris back ahead, 60-63, with under 4 minutes left. Hanga scored around the basket and a three-pointer by Adams completed the hosts' comeback, 65-63. 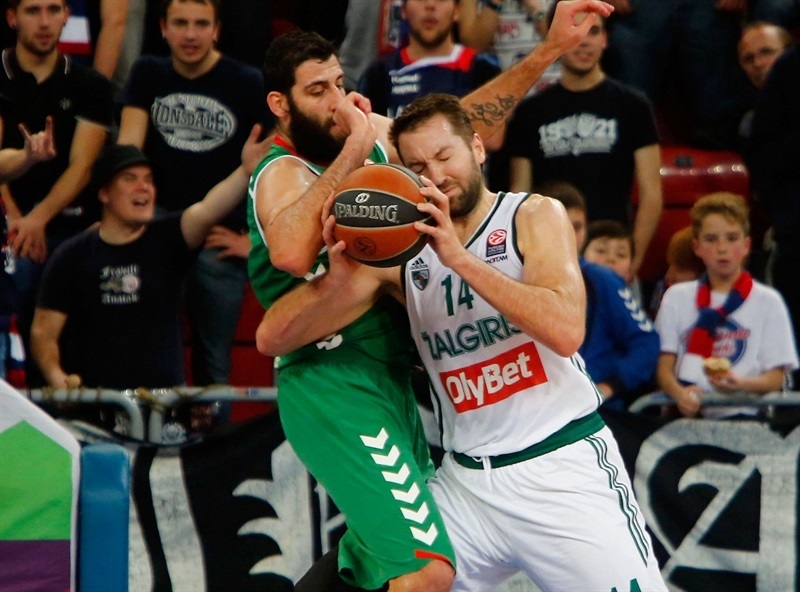 Bourousis and Adams made free throws to seal the outcome, 69-63, with 27.5 seconds left, as Zalgiris never recovered. "We had a game that was far more complicated than some people could have expected, if you just look at the standings. But we are talking about a historic club, with great players and that deserved to be here in the Top16. It's not easy at all to beat them. I think we deserve some credit for this win and how we got it, because the team was against the ropes in the last quarter. But we played very well in the last quarter, in a game that was slow, without good shooting, in which we missed energy as they grabbed a lot of offensive rebounds. But I think that the most important thing for us is that we were able to add another win that gives us hopes to make it to the next stage." "I think we lost an opportunity. We dominated tonight for almost the whole game, until the last minutes where we lost it because of little details, like a turnover, a foul... As usual, we got good and easy shots, but we missed them and that's one of the reasons to explain why we didn't get more wins in the Top16. We came here with a game plan and it worked fine for many minutes, but it wasn't enough. We are going to give our best until the last game of the Top 16 although we know it's difficult that we can qualify. In general terms I have to say I'm happy with our game tonight, but we still miss someone able to close and decide games like this. " "It was a tough game for us. It demanded a lot of energy from us, but we came together as a team and got a very important win against a tough team. It showed us that we cannot have a slow start, but fortunately we were able to adjust and come back to win the game." "It's definitly frustrating losing a game like this. For so much time it seemed we couldn't lose it. We executed our game plan successfully, but we made mistakes, we turned the ball over several times and that hurt us a lot. They are a talented team, very offensive and we managed to keep them under 80 points, we definitely tried to execute well down the stretch, but we were not successful. I wish we could have finished with a better feeling, but now we have to move on for the next game."